This tool is connected to our observing sections; observers will be able to access specific targets of interest through observing section pages. Of course, one can select all categories of targets once they get to the tool. Red flag : those that are in need of observations, past the “cadence” time period of observing. “No Observation” indicates that currently there are no data on the star. Black flag : stars behind the sun therefore not observable (“near solar conjunction” is when the target is less than 30 degrees from the Sun). The rising and/or setting times of the star are shown under the status flag. Please note that these times are based on the "Minimum altitude of target" you specify in your location profile. For example, if you entered 30 degrees as the "Minimum altitude of target" then the rising time doesn't happen until the target gets above 30 degrees and the setting time occurs when the target goes below 30 degrees above your horizon. At the top of each page, there is a menu of possible types of variable stars that can be selected. By clicking on a specific type name and then hitting “Filter observing sections”, specific stars are added to your list. More than one category can be selected at a time. Your list can be printed out (in portrait or landscape format), or can be exported to excel (as a csv file). In order to take full advantage of the features of this tool, it is recommended that you set up an account. To do this, click “Log In” in the upper right corner of the screen. In the menu that opens, click “Sign Up”. This will open a form into which you should enter your name, email (only used for lost password purposes) and a password of your choice. The remaining four fields in the Profile Form are for entering information about your observing site. This will help the tool to determine what stars are visible from your location when you click “Show only targets that are visible tonight” on the home screen. Latitude of telescope: Should be entered in degrees with South latitudes negative (+90 to -90 accepted). Longitude of telescope: Should be entered in degrees East or West of Greenwich where West longitudes are negative (-180 to +180 accepted). Minimum altitude of target: If you have trees, hills or other obstructions in your observing site, or want to ensure that the airmass is not too high, you can use this field to specify the minimum altitude for which targets should be included. Measured in degrees above the horizon (0 to 90 accepted). Altitude of sun at dusk: This parameter can be used to specify your preference for the state of twilight marking the beginning and end of your observing night. The value entered must be the degrees below the horizon of the Sun. For example, if you do not plan to observe during Astronomical Twilight enter -18, for Nautical Twilight enter -12, for Civil Twilight enter -6. If you want to see targets that are visible at sunrise enter 0. (0 to -90 accepted). Once your profile is complete, click the blue “Sign Up” button at the bottom of the form to save it. 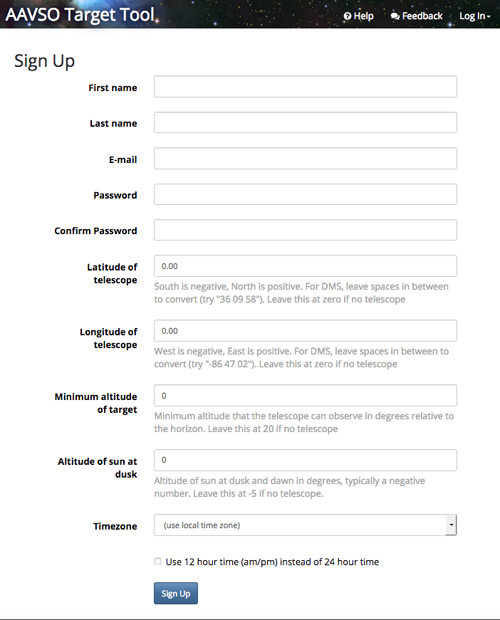 Your telescope latitude and longitude will now show up on the form whenever you log in to the tool. Should you wish to change your telescope location or any other parameters on your profile, click the “Edit Location” button, located under your telescope latitude and longitude displayed near the top of the main page.